Happy New Year! Here we are at the spring equinox already … where does the time go? If only I had been hibernating. I might have avoided the cough, then the cold and loss of taste that accompanied them both. And the weight gain! 😱 I ate my way through them both because my mother always said “feed a cold and starve a fever”. I definitely had no fever. And of course I always do what I’m told. So, telling myself the next thing I ate would taste nice I munched. And munched. And munched. But it could have been cardboard (not that I’m in the habit of eating cardboard!). So, today the sun is shining, my taste has returned and all is good in my little world. I’ve even made a few new dishes. I’m trying to clear out some cookbooks – I read somewhere that if you found one that you hadn’t cooked from, pick a recipe and if you enjoy the result, keep the book. Good thinking! I’ve had the book New Feast (modern middle eastern vegetarian) by Greg and Lucy Malouf for quite a while and never cooked from it. Why? Who knows, as it reads well. Egyptian breakfast beans with feta, lemon oil and green chilli relish was the dish I chose. No relish as I had no pickled chillies. 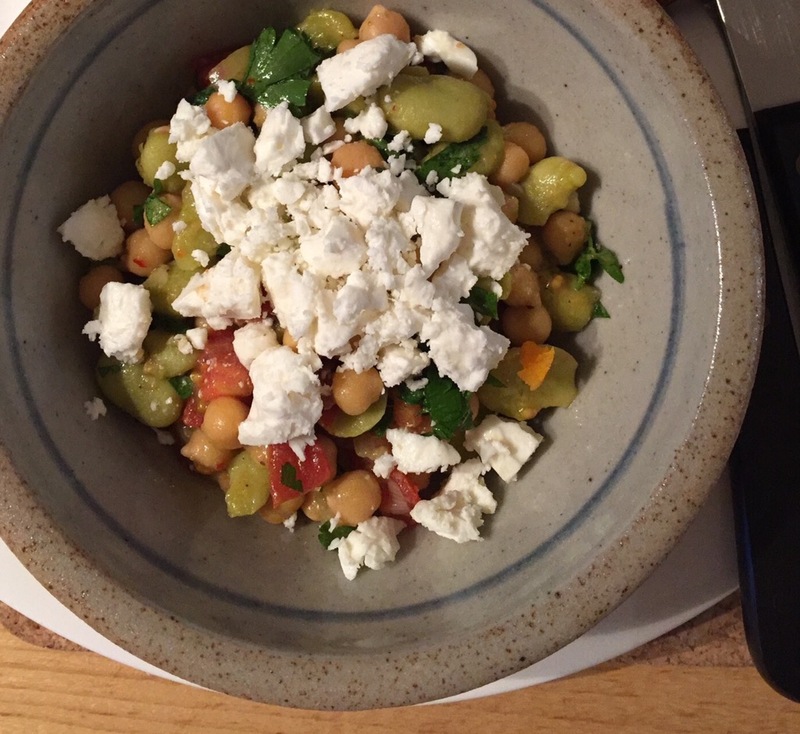 It was a lovely combination of chickpeas, broad beans, tomatoes and spring onion. It was also served warm. The olive oil and lemon juice dressing was gently warmed and the spring onions gently cooked along with a spicy garlic paste (garlic, salt, cumin, chilli, black pepper). When they were soft, everything else was added. Five minutes warming, a good sprinkling of parsley, some crumbled feta and it was ready to go. First night I ate it on its own and next day for lunch I had it on sourdough toast with a fried egg on top (without the feta). It looks like this book is a keeper as I loved this salad and I’ve already made something else (equally delicious) which I’ll save for another day. … and that doesn’t mean us! This delicious chicken dish is from the book of the same name by Gennaro Contaldo and the late Antonio Carluccio. It is such a find although I’m afraid I don’t use fresh artichokes nor rosemary. One tray and into the oven it goes! It is good to have a plain green vegetable to serve with it – I usually do broccoli. 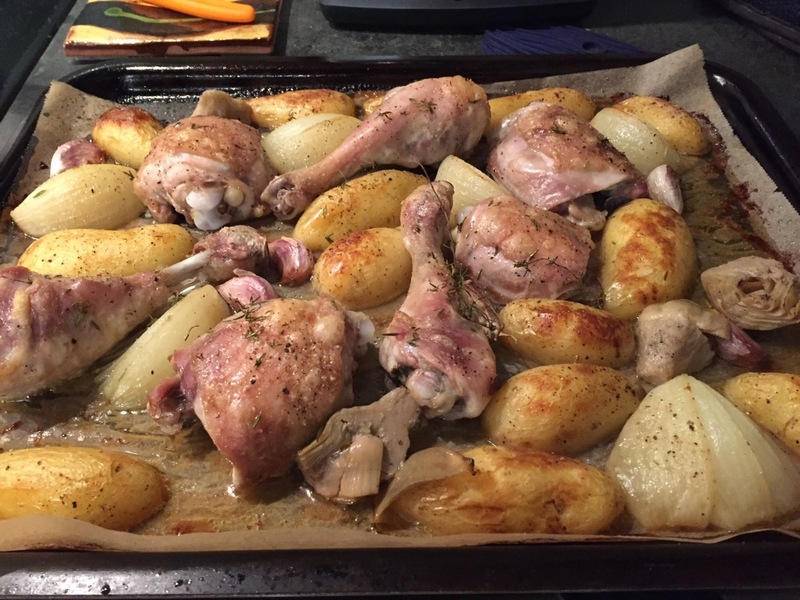 What you need is a mix of chicken thighs and drumsticks (or just one or the other depending on your preference), potatoes, onion, garlic, some fresh thyme and a jar of chargrilled artichokes in oil. Charlotte potatoes work well for this dish but I’ve used others with equal success. The colour of onion is up to you but choose a larger one (or two depending how many you’re cooking for). I haven’t put numbers because this dish is only limited to what you can get on the tray in a single layer! Firstly divide the onion(s) into six, keeping it attached at the root. Cut the potatoes in half ( if they’re the size of charlotte salad potatoes) and take as many unpeeled cloves of garlic as you fancy and put all these into a bowl with some of the oil from the jar of artichokes. 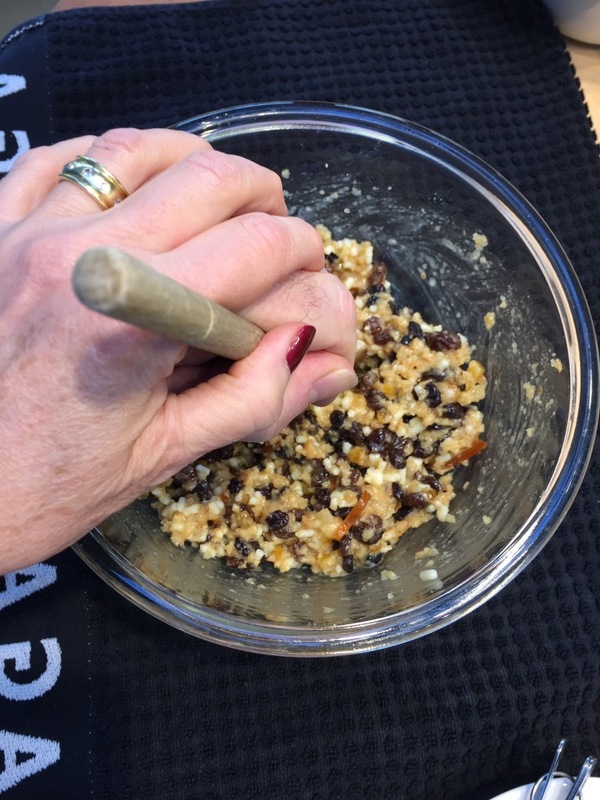 Mix with your hands and place on a baking tray (preferable covered with non-stick baking parchment). Then put the chicken portions into the same bowl, add some more of the oil from the jar and place them on the tray too. Season generously and sprinkle with lots of thyme. Only put the artichokes on for the last 10-15 minutes to heat through. For baking in the Aga I put the potatoes flat side down and cook on the floor of the roasting oven for half the time, then put up to the top of the oven for the rest of the time. 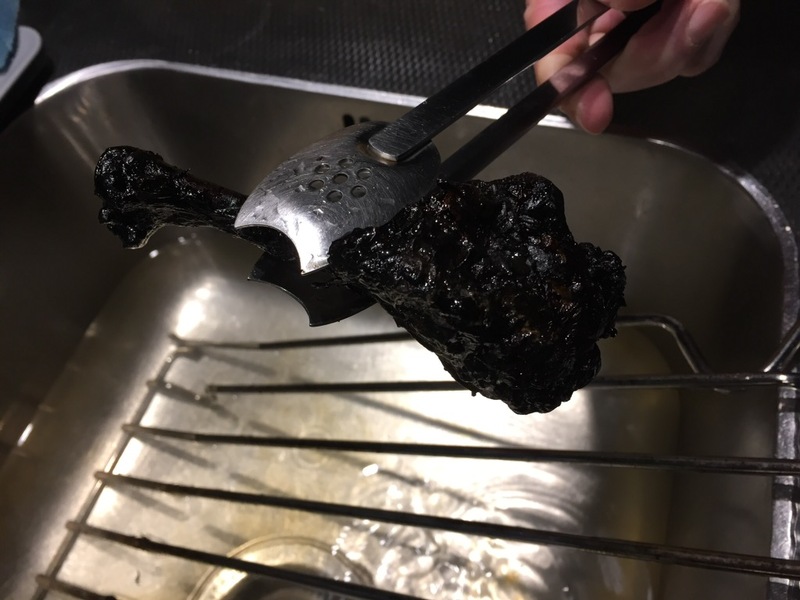 It can take anything between 45mins and an hour depending on the size of the chicken portions, but do check they’re cooked through before serving. For a regular oven, 200C for about an hour is recommended. I usually do enough for us to have chicken salad, club sandwich or something similar the next night BUT….. I think it got caught on the roof of the Aga and let me tell you the smell was not the sweetest! We just kept wondering where it was coming from! Luckily there is still enough – uncharred – for tonight! Now it’s steaming merrily away and I’m so happy that for once, I’m not having a meltdown because I’m so behind with everything (although I seem to get there in the end). I do garnish with holly but the birds have long since eaten the berries so their toxicity doesn’t pose a problem for us. I feel like the whole of January and some of February I was full of the miseries of not just one, but two colds! So I’m not going to say happy new year at this point because here we are in March and, frankly, it would just be embarrassing! So, while I was lying on the sofa, nicely tucked up with my blanket to keep me and my cold cosy, I put on an episode of Saturday Kitchen. 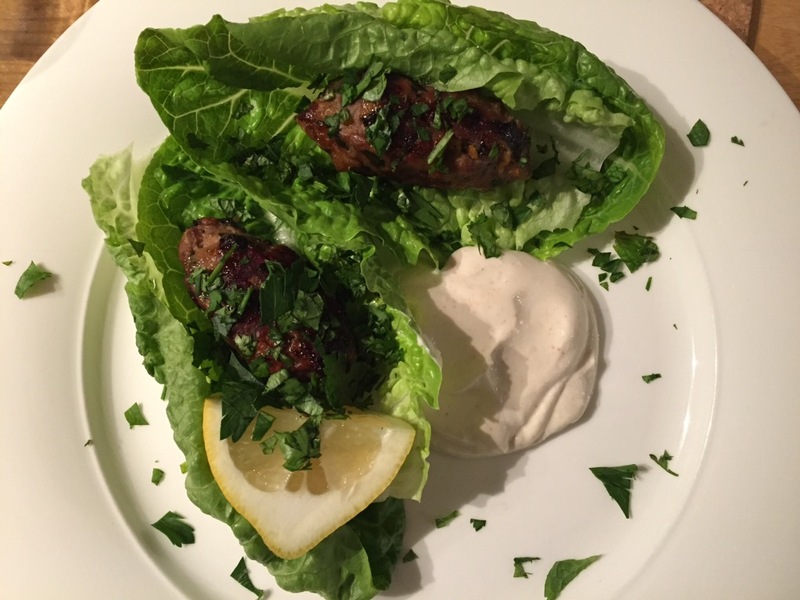 I fully expected to have a nice snooze but Tonia Buxton kept me awake making her lamb koftas with a spicy tahini dip! They are really easy to make and I have now made them twice. 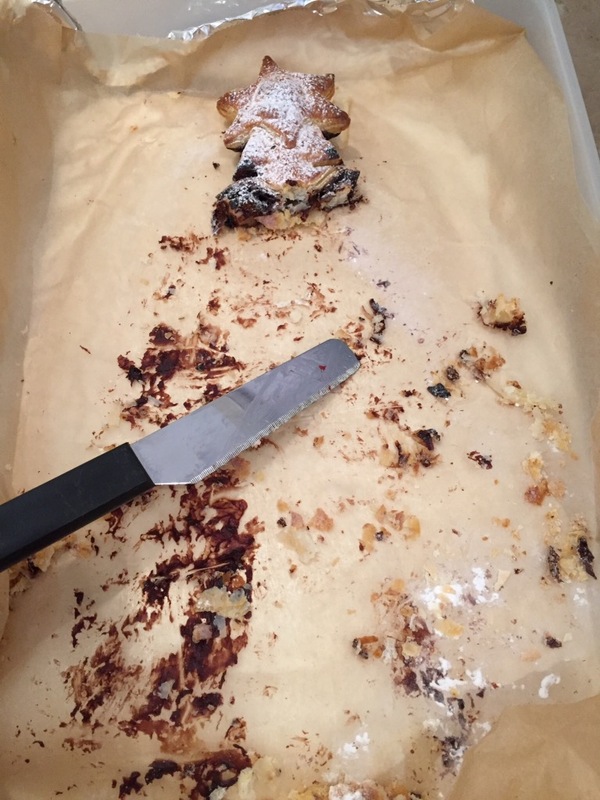 The first time I overcooked them – I followed Tonia’s timings but baked them in the Aga, so I only have myself to blame for not checking them earlier! 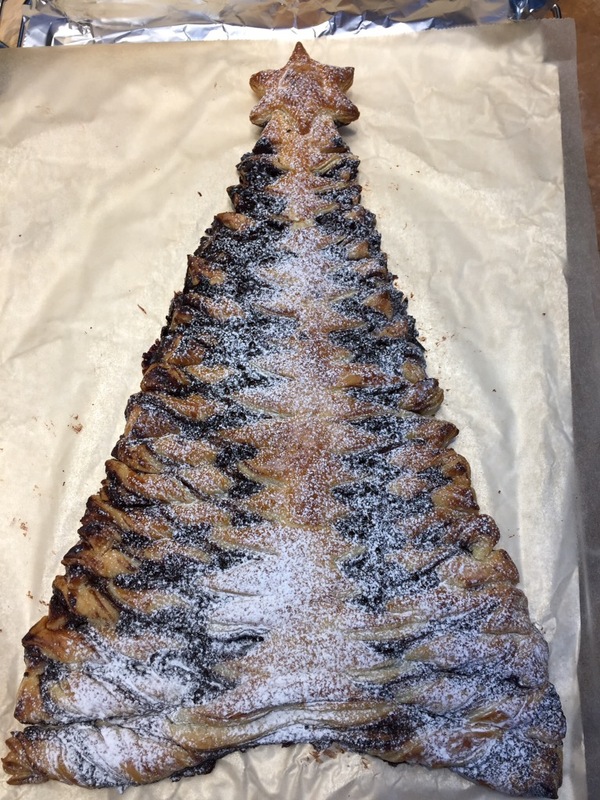 They were only a little bit overdone – thankfully! Second time around, they were perfectly cooked. The dip was delicious but very garlicky so I reduced the number of cloves from four to one and also felt that it didn’t require the juice from two lemons, one was plenty. It’s a really good dish to have if you’re trying to avoid bread as they’re served in lovely little gem lettuce leaves. We also had roasted sweet potato as there was some leftover from making the koftas. (Actually my sweet potato was enormous!) They also freeze beautifully and defrost fairly quickly, which is useful to know. 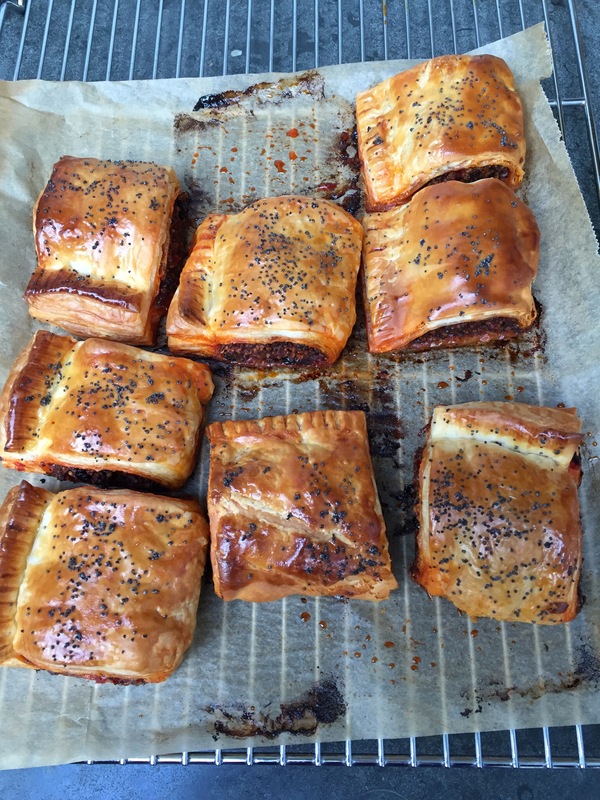 I also have a point to note from making/freezing the lamb sausage rolls in my previous post. The first time I made them I cooked them then froze them and consequently when I defrosted/reheated them, they were a little dry. The second time I made them I froze them raw. This is definitely the way to go as they turned out brilliantly and were not dried out in the slightest. I hope you give the sausage rolls or the koftas – or both – a try, as they’re both very tasty. I know it’s been a while, so let’s hope you’ve missed me and I’ll move swiftly on! I recently lent the Bourke Street Bakery bread book to a friend and after she returned it I sat down and began flicking through it, as you do. The recipe for lamb, harissa and almond sausage rolls caught my eye BUT, this being the weekend before Christmas when I have lists on my lists, I thought I’d take a few shortcuts. The recipe includes a list of ingredients for making your own harissa and also making your own puff pastry but neither of these things were going to happen in my kitchen today so I bought a jar of Belazu Rose Harissa and some ready rolled puff pastry. I know, shame on me! Mix the minced lamb, harissa, couscous, currants, salt and pepper together well and divide into two equal (ish) pieces and roll each one into a sausage shape. Take the pastry out of the packaging and place on some non-stick baking parchment. Then place one of the sausages along the middle of the pastry, lengthwise. Brush the long edge nearest you with egg wash and fold the other edge over to seal, flattening the sausage a bit as you do so. Repeat with the other bit of pastry and sausage. Trim the long edge and mark nicely with a fork. Brush with egg wash and sprinkle with poppy seeds. Divide each one into five (or 4 if you like them a bit bigger) and bake on a baking tray in the centre of the hot oven of a two oven Aga for about half an hour – you might need to use the cold shelf after about twenty minutes to stop them from becoming too brown (or at 350/375 degrees F approximately until filling is cooked right through). Leave on a rack to cool. I’m sure you’ve noticed there are no almonds in mine but only because I didn’t have any blanched ones. I think they would be a great addition. I’d like to wish everyone a very merry Christmas and a happy, healthy 2017! I am truly impressed. 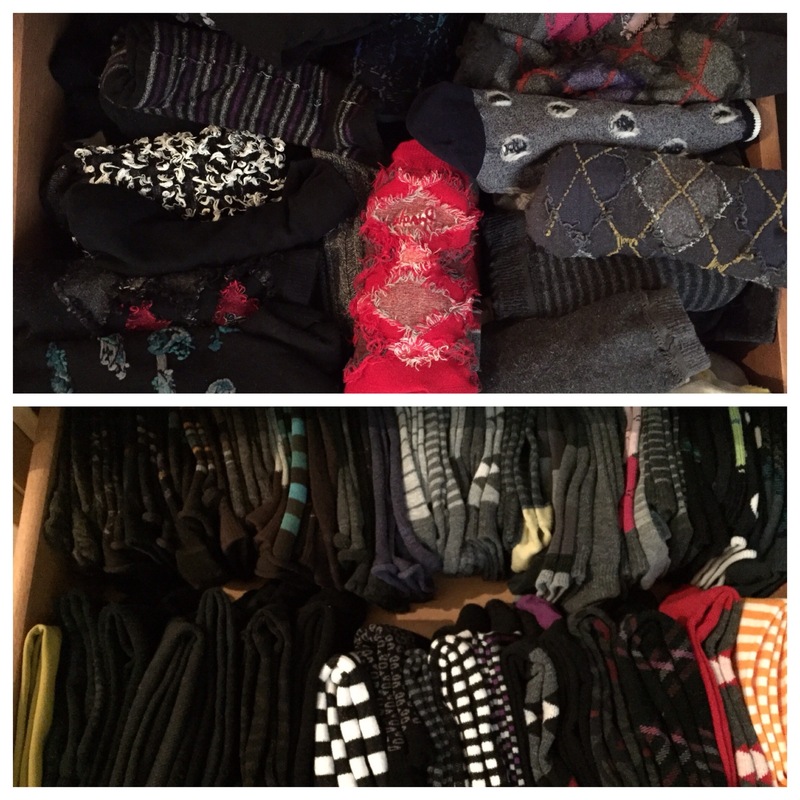 Not only can I see all my socks at a glance, I no longer have to wade through a double layer of them – real timesaver when I’m trying to co-ordinate myself in the morning! I took the opportunity to have a bit of a clear out too. I confess I haven’t quite finished Marie Kondo’s book (hence the untidy sock drawer) but fully intend will try to follow her method to ensure I become a much tidier person. And just so you know, I didn’t have to iron them. Phew!